Aestheticians intuitively recognize these attributes, and real life examples of these features can be seen on virtually all magazine cover models. Gravity and aging cause wear and tear on these youthful features, causing lower lids to lengthen and cheeks to sag and become hollow. Conventional brow, eye and facelifts only allow the surgeon to remove or tighten facial tissues, producing a look that may be better but is often unnatural and exaggerated. We have all seen victims of this type of cosmetic surgery who look perpetually surprised from brows which were raised too high, round hollow eyes from excess skin and neck fat removal, uneven or overdone necks, or lower eyelids which merge unnaturally with overly flat and windswept cheeks. 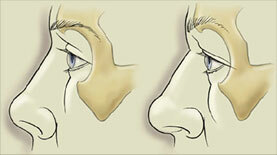 To see examples of these surgically created deformities, click here. Using his extensive craniofacial surgery experience restoring congenitally deformed faces and repairing facial trauma, Dr. Yaremchuk adapts and uses these advanced concepts and delicate techniques in his cosmetic surgery practice. For example, he is one of the few surgeons to perform subperiosteal brow and midface lifts: facial soft tissues are detached from the facial skeleton and resuspended to restore a youthful, yet natural look. Together with eyelid surgery, this procedure allows restoration of a youthful face (as noted above): eyebrows with an 'apex lateral slant,' narrow eye openings, short eyelids and full cheeks. Dr. Yaremchuk's technique of lower face lift, whereby the SMAS -platysma and overlying soft tissues are repositioned restores a well defined, but soft, neck contour.